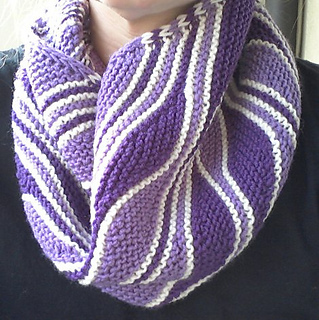 This cowl is knitted in a rhomboid shape that is grafted at the shorter end. 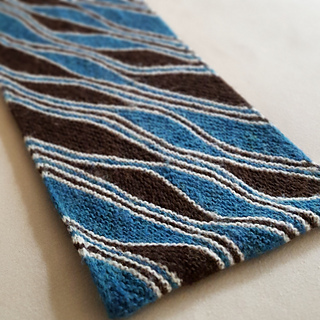 The wavy design is created by stacks of short rows interspersed with full garter stitch rows of a contrasting colour. A regular edging is added by knitting 3 stitches on each side on the RS and slipping them on the WS. A danish version of this pattern is available here. Thank you, MarianneHo, for this translation. Published an update in which I fixed minor typos. I have published a commented example of the first 5 sections on my blog. 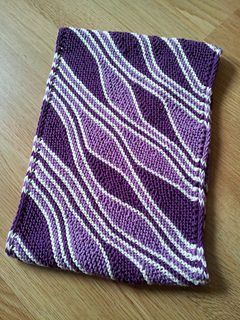 This example is also included in the new PDF version that I just published on Ravelry. 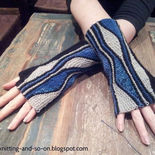 I have uploaded a new pattern version that includes the topics discussed in the test thread. I am very grateful to my test knitters for commenting on the pattern, asking questions and finding out where my descriptions were not as understandable as I had hope. Thanks! After receiving the first feedbacks from my testers, I have published a first updated version. 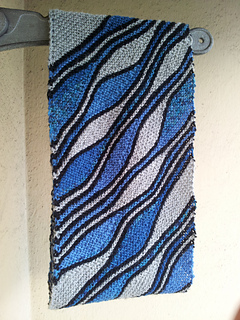 Dec 24, 2012: I have just started a test knit for this cowl … after the test knit is finished, the pattern will be updated. Link to test thread.